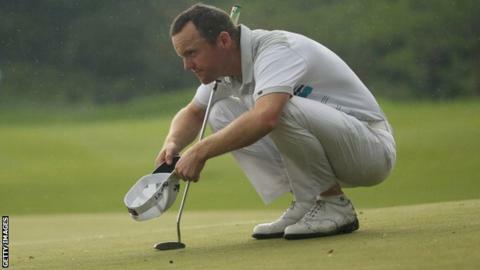 Michael Hoey continued his good form in 2014 as a closing 68 earned him a share of eighth place at the China Open. However, the Galgorm Castle touring pro rued a faltering finish as he dropped three shots in his last three holes after going to the turn in 31. "It was really hot today and I just couldn't keep it going," said Hoey, 35. "I could have easily finished third or fourth but I would have taken another top-10 finish at the start of the week. It keeps my consistency going." The Northern Irishman's season so far has included a second place at the Tshwane Open in South Africa and a share of 10th at the Abu Dhabi Championship. Despite suffering in the conditions, five-time European Tour winner Hoey carded seven birdies in his opening 14 holes before his first blemish of the day came with a double bogey at the short 16th. He was unable to profit from a stroke of luck at the final hole when his ball rebounded from a grandstand on to the green as he three-putted from distance. "I just didn't feel too well out there today. The sweat was absolutely pouring off me," added the 35-year-old. Hoey's finish earned him just under £40,000 and moved him up to 35th place in the Race to Dubai standings. The Northern Irishman's 10-under total left him nine behind winner France's Alexander Levy. Levy led by three overnight and despite seeing his lead trimmed to one shot midway through the back nine, he regrouped as two late birdies saw him clinch his first European Tour title by four strokes. The Frenchman's 19-under-par total left him four ahead of England's Tommy Fleetwood with Spain's Alvaro Quiros finishing third on 13 under. Hoey was the only Irish player to survive Friday's cut in Shenzhen.